RULES And RESTRICTIONS "WHAFF REWARDS"
The users shall be subject and obedient whaff with regulatory rules and restrictions that are created by the user, if proven whaff violation and known by the parties, it is not impossible whaff user account will be deleted and the remaining balance in your account will not be disbursed. Of course we will not be able to participate again in the program Whaff. 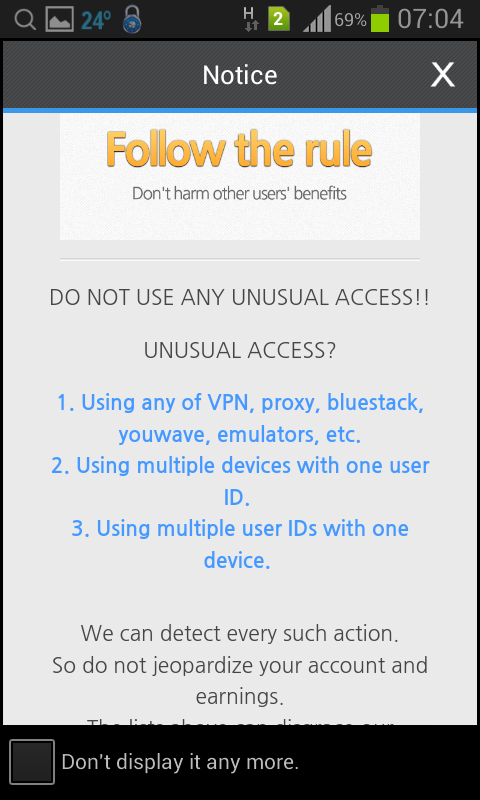 1. the user must not use Whaff VPN/Proxy others who allow illegal entry and access Whaff. 2. Users are prohibited from using some Whaff ID in one Android device. 4. users may not engage in the Act of illegal actions that allow credit/balance will cause scorch. 5. the user can use other application Whaff kind Gift Card Wallets, Juno, Tap Cash etc. 6. must not use android emulator installed on your PC/laptop kind of bluestacks & youwhave etc, anyway Whaff didn't want to run on the emulator because I've tried.Possible to the master can run in the emulator, if you can share here ... he he he ... ...I also want that. Just a suggestion , if the application you downloaded earlier is still in the " PREMIUM PICK " should not be uninstalled or removed from your android , because they are still willing to pay if run for 4 minutes for $ 03 up to $ 0.6 and $ 0.1 if they were on your android . .
That's some rules and ban Whaff for its users, if you have any questions about the program can be contacted via email at whaff whaff@whaff.com or facebook fanspage fb.com/whaff.com. 0 Response to "RULES And RESTRICTIONS WHAFF REWARDS Complete"